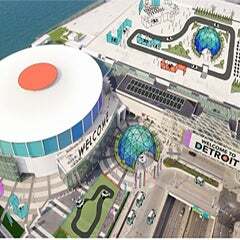 DETROIT January 23, 2018 -- Claude Molinari, general manager of SMG/Cobo Center, today announced that Pure Detroit will occupy the retail space on the first floor of Cobo Center. The store will serve meeting and exhibit attendees, offering a full range of Detroit-centric products. Pure Detroit, which is celebrating nearly 20 years as an original local culture and authentic Detroit apparel shop, has five additional brick-&-mortar shops, each located in landmark Detroit buildings. 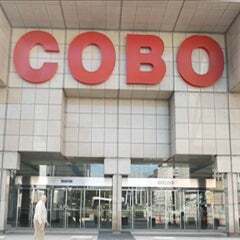 The Cobo Center store opened in time for the 2018 North American International Auto Show. 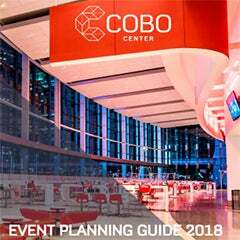 "Cobo Center has an extraordinary legacy as a gathering place,” said Kevin Borsay, Pure Detroit partner. “Pure Detroit is excited to share on-the-ground engagement, focused on Detroit culture with worldwide and regional visitors." Pure Detroit commissioned local artists to incorporate their work in the shop’s new design, including WC Bevan, who designed a new mural on the back wall of the Cobo Center store as well as on the store’s awning. Images of the mural are available here. WC Bevan was born in the 80s. He has practiced art making in Memphis, New York City, and now Detroit. WC's recent mural work is black and white with a focus on visual movement, imaginary architecture and exotic rhythms. His projects can be seen on Instagram @wcbevan. About Pure Detroit: Pure Detroit is celebrating 19 years as the original local culture and authentic Detroit apparel shop. Since 1998, Pure Detroit has continually reinvested in street level brick-&-mortar businesses in the city of Detroit via retail, coffee shops and more. In addition, Pure Detroit has enhanced the cultural cache of the city along the way through one-of-a-kind events, projects and initiatives. Opened on Thanksgiving Day in 1998 in the David Whitney Building, Pure Detroit has grown their retail presence to brick-&-mortar shops in the most architecturally significant landmarks in the city including the Fisher Building, Guardian Building, GM Ren Cen, Belle Isle Aquarium Island Outpost, Midtown's historic Strathmore and now Cobo Center.